Modern Cattle Are Descended From Which Of These Extinct Creatures? Early On, The UNIVAC Computer Made International News By Accurately Predicting A? For millions of years, the precursor to modern cattle roamed across Eurasia, North Africa, and India. These ancient cattle were collectively known as “aurochs” and were divided among three subspecies named for their respective regions: the Eurasian, North African, and Indian aurochs. 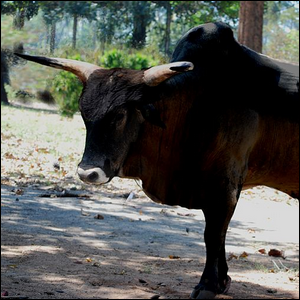 The species very closely resembled modern cattle with broad horns, sturdy shoulders, and long bovine bodies. The North African aurochs were the first species to reach extinction and are believed to have become completely extinct by the Middles Ages. The other two species persisted until at least the Middle Ages, with the last known Eurasian aurochs recorded in Poland in the 17th century. Despite their extinction, however, the aurochs live on, in a manner of speaking, in modern cattle stock around the world. The Indian auroch was domesticated and became the zebu. Even more successful, in terms of present livestock population, the Eurasian auroch survives as the principal ancestor of modern taurine cattle. Taurine cattle constitute the bulk of modern cattle breeds found in the Americas, Europe, throughout Asia, and Australia. Image, an artist’s rendering of an auroch, by Jochen Ackermann/Wikimedia.